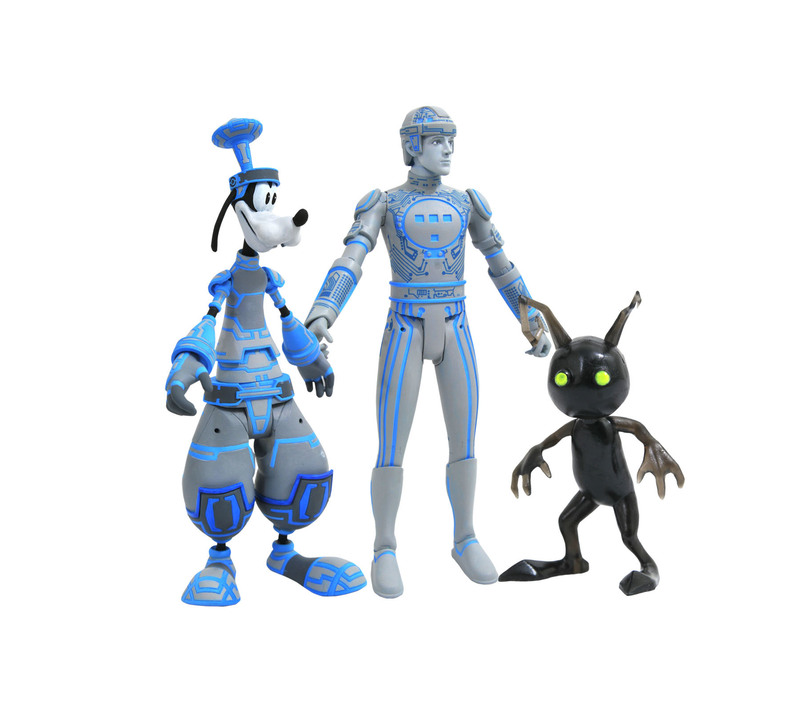 Okay im not big into the kingdom hearts stuff but those tron ones are awesome! Same here. I'll gladly pick up the Tron and Sark packs. Based on the price for a three pack, are these 3.75/4" or are they 6" (they do have the DCUC type joints)? I can't believe after all this time, this is the first (and still only) way to get classic Tron figures since the originals. The old Medicom figures are cool, but still don't really have a strong likeness. I hate having to buy multi-packs for one figure, but I guess I will be for Tron and Sark. Last edited by Dake; 06-11-2018 at 06:45 AM..
Based on the price for a three pack, are these 3.75/4"? No, they're 7" scale, but guys like Mickey, Sora, Goofy, etc. will be naturally smaller. Mickey, Donald, the Shadows will be roughly 4" tall or so, while most of their human characters will be about 7" tall. They're trying to keep the full line of characters in scale with each other. The accessories are minimal, and there's no diorama parts, which is how they are keeping the 3-packs at $25. Guess I'm buying some 3-packs in the near future. Getting these specifically for Tron and Sark...hope they come with their discs. So who wants the Kingdom Hearts characters that come with the Tron figures? Finally some TRON goodies! Disc included? And do you guys think it's too much to hope for a full line, complete with lightcycles? This is awesome, I can't wait to grab Tron at least. Good on Diamond Select for using the license to get these collector desired figures out. There won't be a full Tron line. And DST, as far as I remember, hasn't done much in the way of 1/10 scale vehicles. So Kingdom Hearts figures is probably all there is. Noooooo! I just want the Tron figs... I never even played Kingdom Hearts. They should have a classic Tron 3 pack and Kingdom Heart Tron 3 pack IMO instead of mixing them up. No knee articulation on the Tron figures? It's there, just hard to see. If you zoom in on Tron's knees, you an clearly see the articulation cuts. Last edited by Joe Moore; 06-12-2018 at 03:46 AM.. I will join the chorus: want the Tron stuff, don't want the Kingdom Hearts stuff.